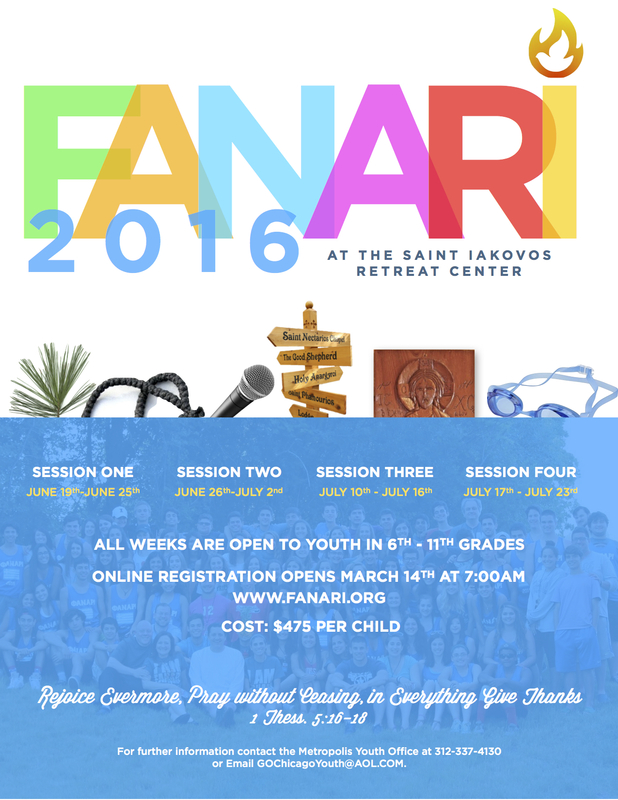 Every summer has a story…make Fanari Camp 2016 a part of yours! Online registration opens on Monday, March 14th at 7:00am when www.fanari.org will be updated with a link to register. We’re anticipating another exciting summer at Fanari Camp, located at the St. Iakovos Retreat Center in Kansasville, WI! Come enjoy the beauty of the land and facility, delicious food and fun activities, along with our enthusiastic staff who is filled with the enduring Fanari Camp spirit! Each week we will be able to house approximately 110-120 campers. There is a first come first serve policy. Once a week is full, there will be an option to be put on a waiting list or to register for another week that is open. It is recommended that if you are put on a waiting list for the week you prefer, go ahead and also register for your 2nd choice, as well. If you are brought up from the waiting list, you can choose which of the 2 weeks you would like to attend at the time you are notified. SCHOLARSHIPS are available for those in financial need. LEADERSHIP 100 is again offering full or partial scholarships to defray your registration costs. All you need to do is talk to your parish priest about what assistance you need and once they contact the Camp Director and you are accepted, you will be given a coupon code to enter in your online registration. For those wishing to apply for the 4 scholarships that GAMA (Greek American Motorcycle Association) has to offer for Session 4, July 17th-23, please see their website for full details. CLICK HERE for GAMA scholarship. If you have any questions, please contact the Director, Deacon Chris Avramopoulos, at gochicagoyouth@aol.com or 312-337-4130. We look forward to seeing you all, rekindling old and building new friendships again this summer!